'♔ Cominica Blog ♔: Sigma Beauty F80 Flat Kabuki brush - Love it! 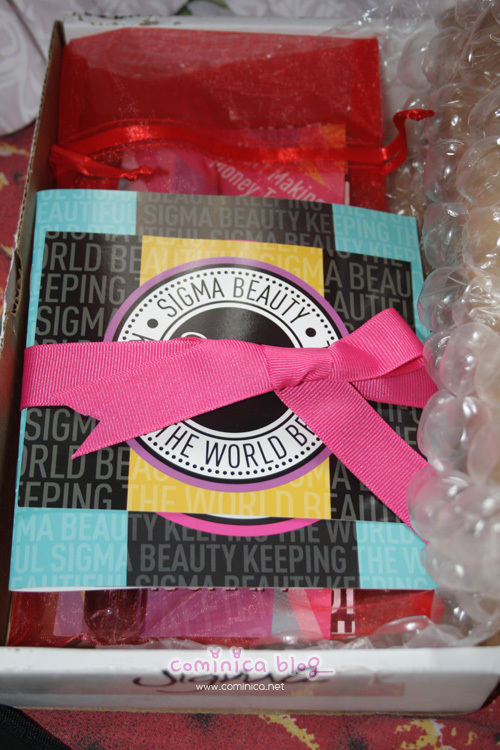 Hello ladies~~ (≧∇≦)/, Yesterday I received a package from Sigma Beauty. A weeks ago, Vincy from Sigma Beauty emailed me and invite me to join Sigma Beauty affliate program. I was really interested and try it, Vincy is so nice and helpful! (///∇//)\ So, after I joined in the program, I've got a gift from her and it's a Flat Kabuki F80 brush from Sigmax Synthetic Collection. Seriously, this is my first time trying Sigma Beauty brush. Lol. When I've got the brush, I read the description on the brochure inside the box. Ideal for all over application of liquid and cream formula in large and mostly flat areas of the face, such as the forehead, temples and cheeks. This brush is perfect to seamslessly buff foundation onto the skin. After read it, I was so curious to try it! ≧△≦, So when I wanted to go out for dinner I tried this brush when appliying Revlon Color Stay on my face. I've tried using a sponge before for this foundation but it's not good! But, this brush really works like miracle @_@, I'm not blabbing but my pores look invisible when applying with this brush and look so smooth. This brush is really easy to use and handle, so soft and blend the foundation nicely. ⊙▽⊙ This is so different if compared to my Everyday Mineral flat top brush. And didn't want to end the experience on that, I've tried using Canmake Cream Cheek with this brush too. And guess what? It blend so well and look natural than applied with my fingers (lol, sorry I don't have many collection of brush （゜◇゜）\ ). Someone told me, If we apply make up with a quality brush it will look different. I don't really believe that words, but now I'm starting to think it's true. Isn't it? Or it's just me ._. Thank you so much Vincy and Sigma Beauty for this gift! I love using that brush for liquid foundation.. it really is amazing! Sigma brushes are really popular these days.. I've never tried it, but according to your review, it's seems like a good brush :) Thanks for the review dear.. I really want to try sigma brushes too but I need a job first haha! Oh I love flat top brushes! I wanna get this one! x3 sigma f80 is great just like I thought.. xD it's very popular among beauty bloggers..
btw can you make a comparison between this sigma flat top & EDM flat top? I love it!! I'll visit the store! looks so interesant! gosh, you look so pretty! your eyes is so adorable! woah your skin looks really smooth *_* pretty! aku jg suka sigma brush, bagus yaa =D . comi muka nya muluus bgt, cantiiknyaa. I have a similar brush and it also does wonders in apply foundation. You can definitely see the difference!! I seriously need a brush that works so well for my foundation/bb cream~~ I would like to know which website did you purchase please? Do they do shipping to Malaysia?